Poker Pool is a fun alternative billiard game, combining the luck of the cards with the skills of pool for a great strategy exercise that requires you to think on your feet. This is the perfect game to play when you have an odd number of players and can become a really technical game depending on the skill levels involved. Generally, players are dealt a hand of cards; each card represents a different ball on the table. The object of the game is to run your hand out by pocketing the balls that match the cards you are given. This ball set is the standard 2-1/4" in diameter and made to full Aramith standards. 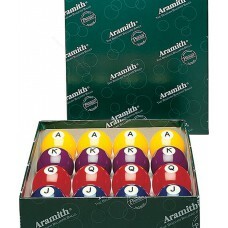 Included are 4 yellow "A" balls, 4 purple "K" balls, 4 red "Q" balls and 4 blue "J" balls.